Ticking off the Beatles songs you never heard the Beatles sing live tonight was a setlist unto itself. ‘I’ve Got A Feeling’, ‘Blackbird’, ‘Eleanor Rigby’, ‘Being For The Benefit of Mr Kite, ‘Something’, ‘A Day In The Life’, ‘Ob-La-Di, Ob-La-Da’, ‘Back In The USSR’, ‘Let It Be’, ‘Hey Jude’, ‘Sgt Peppers Lonely Hearts Club Band’, ‘Being For The Benefit of Mr Kite’, ‘Helter Skelter’, ‘Lady Madonna’, ‘Golden Slumbers’, ‘Carry That Weight’ and ‘The End’. It began with ‘A Hard Days Night’. When they were still touring they also never performed already recorded ‘I’ve Just Seen A Face’ or ‘You Won’t See Me’. 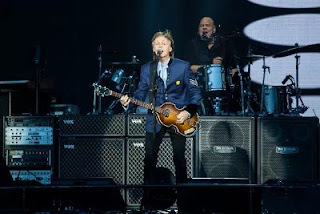 19 of the 24 Beatles songs Sir Paul McCartney performed tonight in Melbourne were NEVER performed live by The Beatles. Just think about that. How special does it make a McCartney show in 2017? Answer: Very bloody special. I interviewed George Harrison in 1993. I asked him about the band stopping touring and if he had regrets. He responded that had they not stopped and concentrated on recording their sound would not have evolved to the extent of a ‘Sgt Pepper’ or an ‘Abbey Road’ album. McCartney can give fans in 2017 what he couldn’t in 1967. This show rewrites rock history. Australia last saw Paul McCartney in 1993. 24 years is a long time in between drinks. There were a lot of satisfied faces. Paul’s wife Nancy was in the audience. He dedicated ‘My Valentine’ to her. Linda was name-checked for ‘Maybe I’m Amazed’. What amazed me were the stories between songs. He played a piece of Hendrix’s ‘Foxy Lady’ after Let Me Roll It’ and talked about Jimi learning and playing ‘Sgt Pepper’ live two days after the album was released and being in the audience to witness it. He was funny. He said how he can tell when people like the songs. “We can tell what songs you like from up here. When we do an old Beatles song it lights up like a galaxy with all the phones. And when we do a new song it’s like a black hole. But we don’t care; we’re gonna do them anyway!”. Don’t worry, new isn’t that scary with this show. A couple from the ‘New’ album and that bizarre Kanye West/Rihanna thing is as new as he gets. That song satisfied the young kids of the older fans in the audience dragged along because mum and dad say so. “Oh yeah that guy”. It was great to see Melbourne students from the Scotch College Band given a chance to be part of ‘Mull of Kintyre’. Those kids will cherish that moment for the rest of their lives. The take-home from the show is the calibre of songs and the calibre of the band. This is mostly a Beatles show with a few songs from Wings and a smattering of McCartney solo with only three songs from the 21st century. Does it get any better? No. Well, maybe The Stones for song calibre and Springsteen for live performance. But hey they were all Gudinski tours in Australia, so win/win/win for the Melbourne guy. Congrats to Michael Gudinski. He has toured the three biggest acts on the planet after winning the Melbourne Cup two years in a row. Now THAT is success.